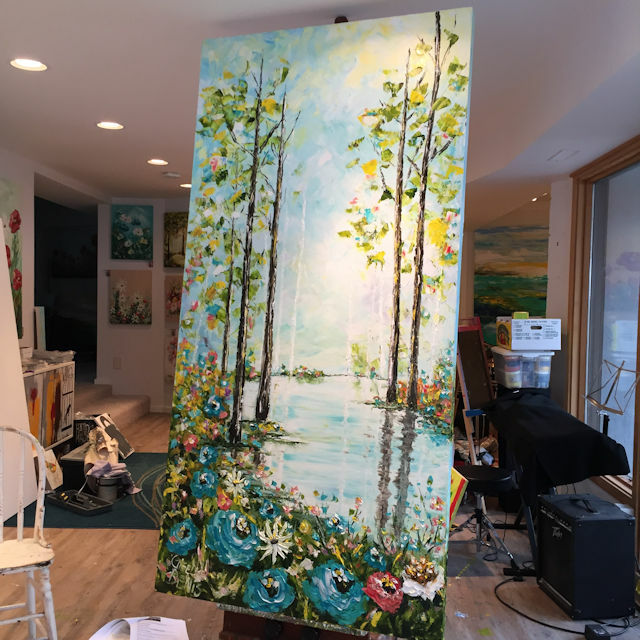 I shared a post on the I Believe In Art Facebook page recently where I conveyed how much the art and life of Claude Monet inspires me and asked the question, "Who inspires you?". 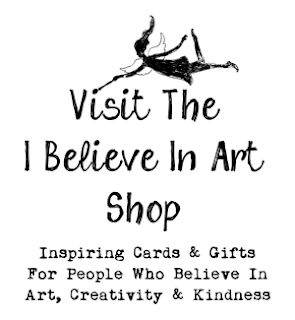 I got some really great responses, including one from Artist Rozanna Moore McConnell of Indigo Child Studios where she mentioned another artist in her community, Giselle Denis. As soon as I clicked over to Giselle's Facebook page, I saw why Rozanna was so impressed by her. Not only is Giselle's art amazing but her passion and commitment to her craft is awe inspiring. I knew I had to ask her if she would do an interview for this blog. I'm sure once you are done reading it, you will see why I was so excited when she agreed. Enjoy! 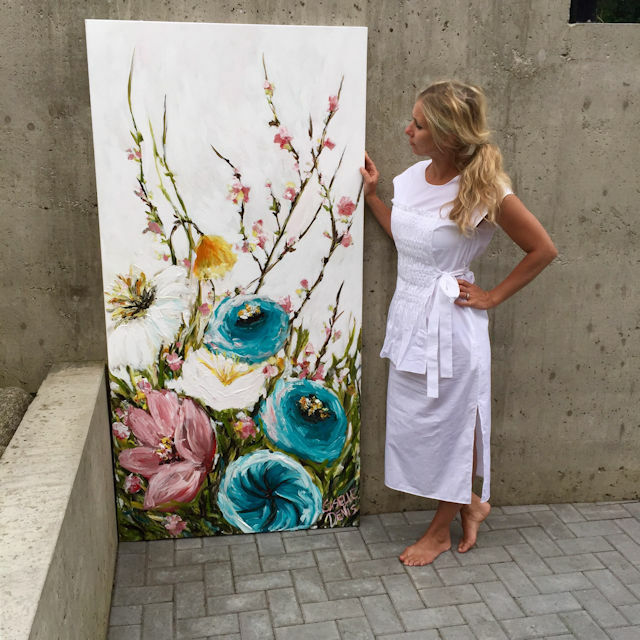 Artist Giselle Denis In Her Studio With Her Painting, "Believing In The Bliss". Giselle: My art represents hope and truth. Giselle: Claude Monet. The lightness in which he held his brush and the way he saw and looked at the world, and translated that perspective onto canvas. His brushstrokes were light, loose and playful. My approach is similar. I try to keep things loose and playful. Not overworked. More of a suggestion of a scene, rather than an actual scene. I feel like Monet painted the feeling of a place, rather than the literal place. -Long hours in the studio, which leads me down pathways of new direction and creative ideas. -Art shows to paint & prepare for. -Thankfulness & gratitude to have the privilege of being an artist. -Ideas that keep me awake at night. -The sound of birds and the shining warmth of the sun. 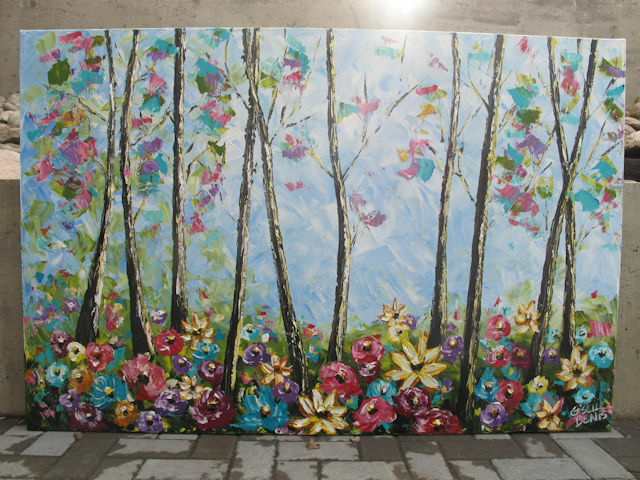 -I love to paint outdoors when I can. I take every opportunity possible to paint “en-plein air” since our outdoor season is so short. -Finishing the painting and naming it and then starting another one. Naming my art is just as fun as creating the painting. I am a trained musician, singer/songwriter. It’s what I was trained to do. But art has become the forefront of what I do. I use my songwriting abilities when naming my art. The sound words make when they roll oﬀ your tongue is important to me in the naming process. It should sound poetic in form. -I love being able to share art so quickly through social media these days. When I began my career, all I had was a website. Now your audience can be thousands of people with a photo and a click of a button. I love sharing why I gave the painting a certain name. Now I share a short story of the process of naming the painting. People really seem to connect with me and engage with me when I share my thoughts on the paintings. -I love sharing my art by painting in public. 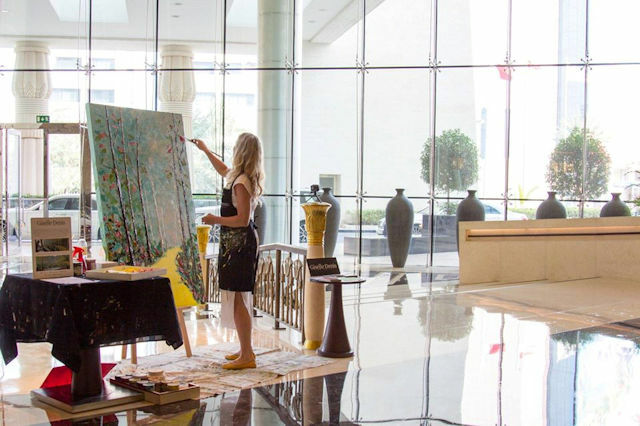 I paint weekly at the Fairmont Hotel Macdonald in Edmonton, Alberta, Canada for their guests. I've been there for 3 years. It’s very rewarding to share my painting process in public. I paint quickly, so live painting is a good ﬁt for me. During a 3-4 hour period, I make 2-3 paintings. -I love the thick juicy paint. Not worrying about how much I go through is very liberating. I buy it by the gallon and have the freedom to use as much as I want. -I love having a working studio space set up at all times, ready to have me come and create in it. -Staying true to who I am, how I see the world and how I paint that world. -When I take on commissions, remaining true to my painting style and learning how to deal with people who want to tell me how to make a great painting. Eﬀectively communicating to my customers why they hired me to make a painting, and then asking them to entrust me as the artist professional to do a great job. 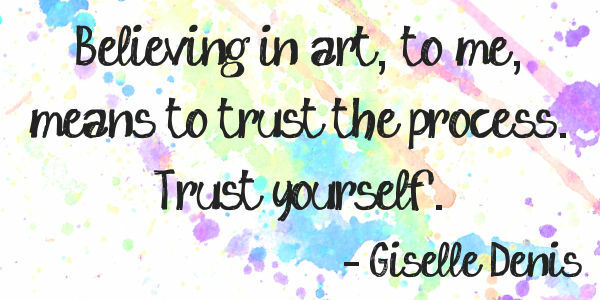 Giselle: Believing in art, to me, means to trust the process. Trust yourself. Don’t second guess yourself, but if you do, trust you will ﬁgure it out. It also means hours spent painting. If you expect huge results but only paint a few times a year, you are not going to see huge results. But if you paint a little bit every day, you will see results a little bit every day. And then one day, you will wake up, and a few years will have gone by and you will see how far you've come. Believe you were created to create. Believe you have it in you. Believe you have unique and special ideas and that no one has your mind and can apply the paint onto canvas the way you do. Only you can see the world through your own eyes. Only you can interpret what you see and feel onto canvas the way you do. My thanks to Giselle, for sharing her art, her insight and her inexhaustible creative spirit with us. And thanks to Rozanna for bringing her to my attention! To learn more about Giselle and her art, connect with her on Facebook, Instagram and/or Twitter. For more "I Believe In Artists" Interviews and to learn how you can apply to be featured, click here. 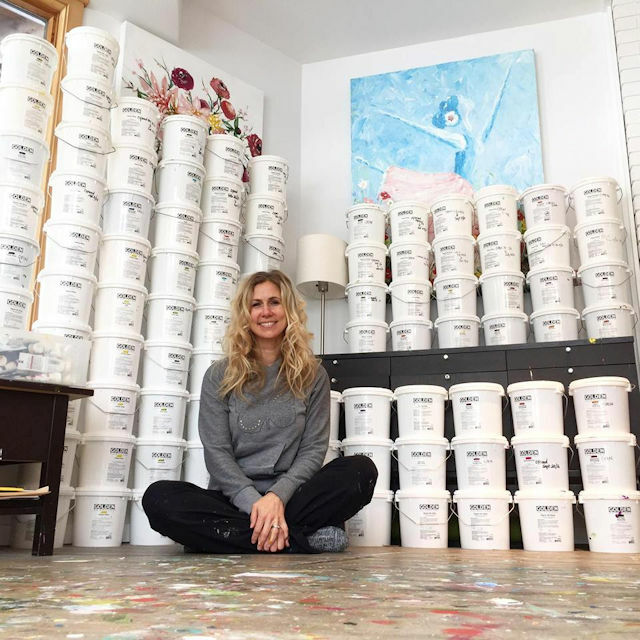 That photo of Giselle with gallons of paint... That's my new visualization of what heaven must look like. :) Thanks for introducing this talented artist. It is an artist's dream! Thanks for reading Susan and happy creating! Giselle's paintings are so calming and peaceful. You can see how she puts emotion into each piece. Thanks for sharing such an inspiring artist! I would love to see her paint in person. This was a great read. Thanks always, Victoria, for your positive, gracious way of building up the art community.